The work of clarinettist Xavier Charles ranges from noise to electro-acoustic via sound poetry. He has played in numerous new music festivals in France and abroad. Charles collaborates with both Jacques Di Donato and Frédéric Le Junter. In his work with groups and collectives, he has also collaborated with Martin Tétrault, The Ex, Pierre Berthet, Etage 34, Axel Dörner, Jérôme Jeanmart, John Butcher, Jean Pallandre, Marc Pichelin, Chris Cutler, Martine Altenburger, Camel Zékri, Emmanuelle Pellegrini, Michel Doneda and Frédéric Blondy. The artist has composed for the theatre, most notably with the Theatre François Lazaro. 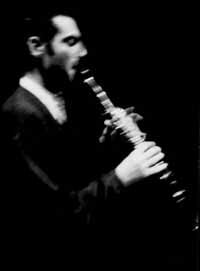 Currently his musical research ranges from performance on the clarinet and bass to the installation of vibrating speakers, at the edge of improvised music, noisy rock and electro-acoustic sound. He's deeply involved in the music world as an organizer of the festival "Densités".